Is your garden looking a little flat and uninteresting? Maybe a little pergola height is needed. 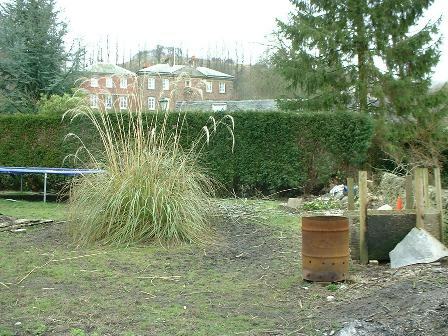 Let's look at some of the things that can be done to transform your garden into a more attractive and appealing place. One of the easiest ways to transform a garden is by giving it some height! 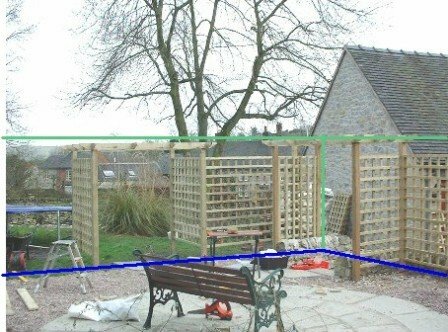 This can be achieved in many different ways and doesn't need to be costly: a section of trellis here; an arch there. Take a look at some basic design techniques to see how to create your own visually appealing space. Gardens are by nature three-dimensional spaces. Even so, they can feel very two-dimensional if the structures and planting are below waist level. This is because our eyes are focused downwards. Picture the old style of garden that used annual bedding plants in borders around a beautifully manicured lawn. Very colourful for three months of the year but neither practical nor desirable for our needs today. As more and more people are using the garden as an outdoor living space, the emphasis has changed, with more focus being placed on interesting garden structures and planting. The garden has become an area of 'designed space' used for relaxation; an escape from the rigours of daily life and the toil of high maintenance gardening! By introducing taller structures, we have the potential to include even more design features - forms, colours, styles, materials, textures and even fragrances. Not only that, gardens look bigger because the height of the structures; whether it's a trellis panel, pergola, an arbour or an arch, as they capture all the space that is contained within, effectively claiming it as part of the garden. Just after building an arch and corner pergola for a client, as part of a garden makeover, she said, "The garden seems so much bigger!" And it did, because she had gained all of her air space. The pergola height was instrumental in achieving this transformation. In fact, it was the garden shown at the top of the page. There were many other interesting features in this garden, but it was the addition of height that had the most impact. 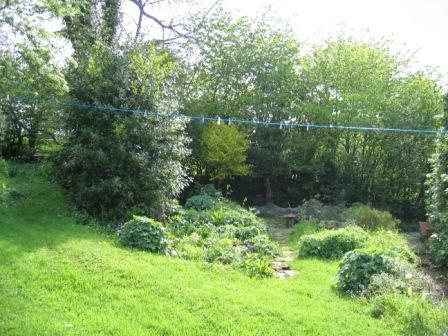 Here we have another garden that was very flat, untidy and open to view. The combination of pergolas and trellis enclose the patio area to give more privacy, height and structure. The blue line shows the original flat, two-dimensional patio, and the green line shows how much space is gained by adding height, giving a much more three-dimensional feel. 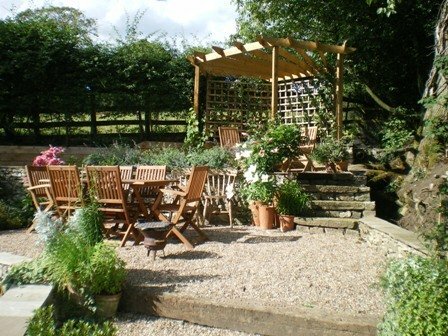 Now this seating area is really lovely, with unusual garden furniture, gorgeous climbing plants and wonderful accessories. ...and here are some different views, afterwards. Just behind the seat are four trellis panels, which separate this part of the garden from the trampoline and utility area. 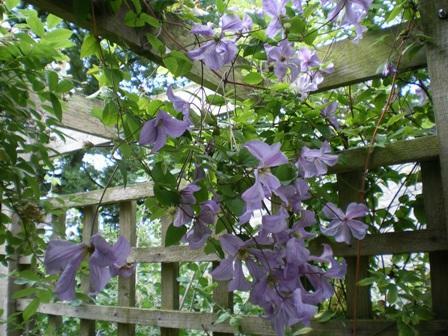 Many different climbing plants cover this trellis, flowering at various times throughout the season. The large plants and shrubs that make up this colourful border also lend height to the garden border. The varied forms. colours and architectural planting creates a lot of interest in this part of the garden. 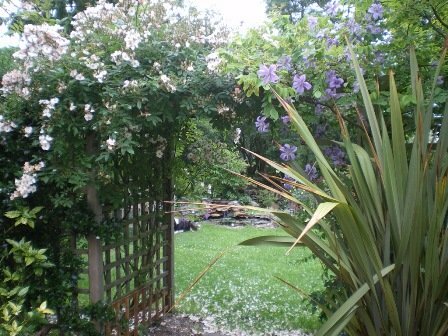 Pergolas, arches and trellis are ideal structures over which to grow the most glorious climbers. A real bonus! Firstly, consider how everything in you garden will fit together. You may be able to do this in your head, but it can sometimes be easier to jot down a simple design on a piece of paper. It doesn't need to be complicated, and it doesn't necessarily need to be to scale. 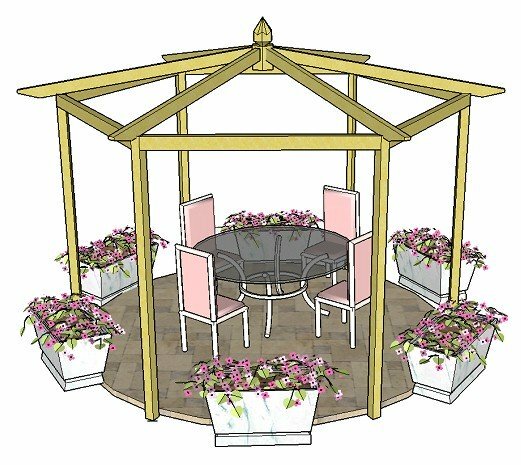 Try to give your structures some purpose: for example, an entranceway, a stand-lone feature, an arbour to sit under, or a divider between two parts of the garden. 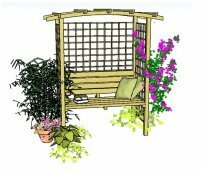 Stand in your garden in a place where you can see most of it, and try to picture what it would look like, for example, with a trellis screen (either several in a straight line, or placed to form a right-angled corner), a pergola or an arbour. Because these structures look so good, it may appear that they are difficult to build, whereas, in actual fact, they are relatively easy; and, with a little effort, can produce brilliant results! 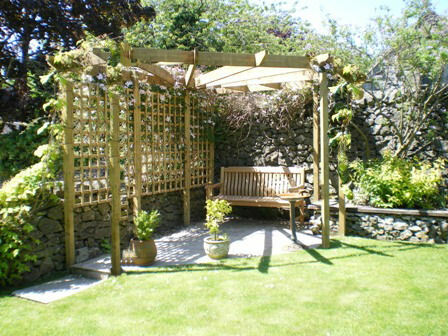 Of course, you don't have to build a pergola yourself (although it is great fun and very rewarding if you do! 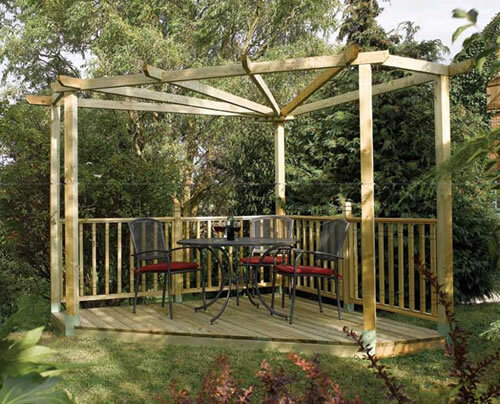 ), as there are many wonderful pergola kits available, in every imaginable style. 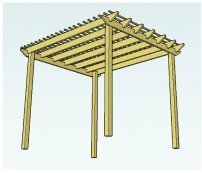 Some interesting structures that you might consider are pergolas, arches, seated and swinging arbours, in various styles and materials (take a look at some of the pergola plans and pergola kits for lots of ideas), gazebos, summerhouses, trellis panels, pergolas with decking, and obelisks. All of these will give instant height and structure to your garden. Then you can add seating areas, decorative gravel, paving and accessories: planters, raised beds, fire pits, chimineas, lights, garden furniture, outdoor clocks and barometers... anything you like really, in order to create a cosy, interesting and welcoming space. I thought I'd mention this here, as another design aspect, that gives both height and interest to a garden, is the use of different levels. If you can incorporate a raised (or indeed sunken) area in the garden then all the better: steps, raised patios, sunken patios, waterfalls and decking can make an instant and significant difference to the appeal of the area. Sloping ground gives ample opportunity for using the natural height of the garden. Retaining walls can create flat areas on which to place garden furniture and structures (depending, of course, on the size of the area). 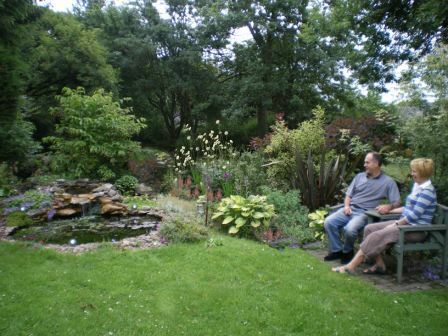 This natural slope has been used to create woodland steps, a water feature, an arch, a dining area, a corner pergola and beautiful cottage garden planting on three levels. The greater the slope, the more dramatic the features become. 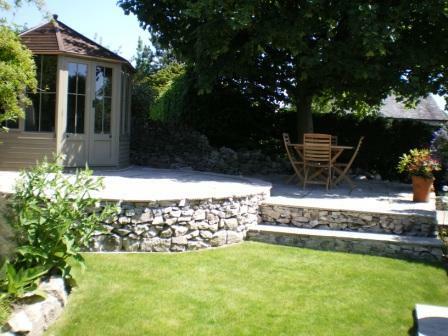 Clients often despair of their sloping gardens, becoming very frustrated with the look and usability of the space. However, a sloping garden can have enormous potential in creating interesting areas. The initial cost of installing retaining walls will be the major one in this type of project, but once completed, there is a lot of scope for wonderful design features. Of course, plants are often the crowning glory, making any garden structure a thing of beauty. 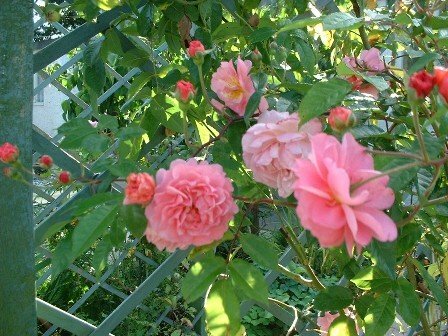 Climbing plants not only look good but can provide fantastic fragrance. Their form, colour and smell surprise us again and again, as they bloom each year. If only for this reason, it's great to have a structure over which to grow these wonderful plants. 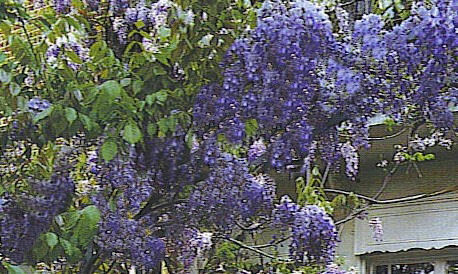 Take a look at some more examples of climbing plants; the icing on the cake! Here's to more interesting and beautiful gardens!